This revised program will begin in the fall 2019 semester for new students. *DEC-BAC: After completion of the college diploma (DEC), graduates of the Nursing Program may continue their studies for two more years (fulltime) to attain a baccalaureate degree in nursing (BAC). The Nursing program is not available to International Students. Students accepted into the program are required to have a valid CPR/First Aid certification and receive vaccinations prior to participating in their clinical practicum in the first semester. The purchase of a stethoscope, laboratory coat and nursing uniform is required beginning in the first semester, in addition to textbooks. The estimated initial cost of equipment is $1,600. Students are also recommended to have a laptop computer. Additional information is available from the coordinator at 819-564-3666, ext. 171. Nursing is a dynamic, research-based profession that plays an important role in the Quebec health care system. The profession needs caring individuals who are interested in a scientifically-based career wherein opportunities include clinical practice, teaching and research in health care, education and the private sector. The three-year nursing program will prepare students to meet the demanding challenges of the nursing profession. Theoretical and experiential learning in state-of-the-art laboratory facilities will be enhanced with fieldwork in hospitals and health care centers of the surrounding region. Students will receive clinical experiences in specialties such as ambulatory care, geriatrics, obstetrics, pediatrics, psychiatry, medicine and surgery. The Comprehensive Assessment is a requirement designed to demonstrate that a student has integrated all the knowledge, skills and attitudes developed throughout the program, including General Education. At Champlain-Lennoxville, this is evaluated in the context of the Integrative Project course called Nursing Integration. Students will individually present a case study of one patient they have cared for during their practicum experience. Graduates who receive the CEGEP diploma, are eligible to write the licensing examinations of the Ordre des infirmières et infirmiers du Québec (Order of Nurses of Quebec). Graduates have the choice to write these examinations in English or in French. In certain instances, depending on the pre-college educational status of the individual, the graduate of the Nursing Program may be required to write the French language competency examination of the Office québécois de la langue française. Champlain College Lennoxville is a partner in the ‘Estrie-Beauce-Montérégie’ – Université de Sherbrooke consortium, wherein the successful nursing graduate can pursue studies in a two year (full-time) Bachelor of Nursing Science degree at the Université de Sherbrooke. Graduates can also apply to similar baccalaureate programs in several other universities in the province. Consult specific universities for details. This course is designed specifically for the Nursing program and is the first mandatory biology course for all nursing students. It introduces students to a broad range of fundamental concepts aimed at building a foundation of biological knowledge necessary for effective nursing practice. Emphasis is placed on the integration of knowledge of the human body and its multiple functions, with instructional approaches best suited to first semester nursing students. The topics introduced in Anatomy and Physiology I can include: introduction to the body and cells, the nervous system, the integumentary system, the skeletal system, and the muscular system. In this course, the student is introduced to the nursing profession and to key concepts that form the foundation of nursing. The Henderson conceptual model of nursing is presented. Within an evidence-based perspective, the student learns about reflective practice, the nursing process and therapeutic nursing plan, critical thinking skills, the therapeutic relationship and basics of communication skills. Ethical and legal dimensions of professional practice are introduced. The role of nursing in the present day healthcare system is examined. Career opportunities for nurses in diverse contexts are explored. In laboratory sessions, the student learns basic nursing care procedures such as vital signs, hygiene, infection prevention and control, patient safety, medication administration, mobility-immobility, nursing assessment, basic wound care, and to apply emergency measures that include CPR. In the practicum, the student provides basic care to adults and elderly clients. The student puts into practice the theoretical knowledge and skills acquired in the classroom and laboratory, as well as knowledge gained in the anatomy and physiology course. Health is as much a social issue as a biological issue. This course explores the sociological dimensions of health and illness in conjunction with population variables such as age, gender, ethnicity and social class. It questions how these variables connect with social inequalities that shape the principal actors (patients, healthcare professionals, etc.) and their interactions within health care settings. This course also presents an introduction to the healthcare system around various social, historical, political and cultural factors that have influenced its key values and its organization. Finally, students will also learn some ethical dimensions of professional roles and responsibilities in nursing. With this course, students will gain a broader perspective on health, illness and healthcare in Canada. Seeing how nursing contributes to improving population health and society, students will also gain some perspective on their future profession. This course is designed specifically for the Nursing program and is the second mandatory biology course for all nursing students. It builds upon the knowledge and skills acquired in Anatomy and Physiology I to continue the exploration of the human body, with a continued emphasis placed on the integration of knowledge of the human body and its multiple functions. Instructional approaches are suited to the progression of learning and knowledge acquired in Anatomy and Physiology I. The topics introduced in Anatomy and Physiology II can include various systems such as: cardiovascular, respiratory, urinary, and digestive. 180-220-LE MEDICINE SURGERY 1 (4-9-4) 195 HRS / 5 2/3 CR. The focus of this course is on care of adult and elderly clients requiring medical/surgical nursing care. The student is introduced to the McGill conceptual model of nursing. Content focus is on common health problems, diagnostic testing, medical and nursing interventions. In the laboratory sessions, the student learns advanced nursing care procedures required for medical-surgical client care. The practicum component takes place in acute medical and surgical care settings. The student plans care and performs interventions based on the knowledge and skills acquired and develops critical thinking skills. The main focus of this course is to provide students with a basic understanding of pharmacotherapy in nursing practice. Content focus is on client-family education, health promotion, safety, documenting and reporting and on legal and ethical principles of medication administration. Laboratory sessions focus on the principal modes of drug administration. The course will provide students with the tools to be able to become more self-aware, improve their communication skills and acquire the ability to help clients and their family at the same time as preserving their own mental and physical health. In this course, students will be exposed to different issues that they might encounter in their clinical practice. Topics related to nursing such as effective communication, the therapeutic relationship, managing stress, conflict resolution, impression formation and professionalism will be addressed. This course is designed specifically for the Nursing program and is the third mandatory biology course for all nursing students. It builds upon the knowledge and skills acquired in Anatomy and Physiology I and II to continue the exploration of the human body, with a continued emphasis placed on the integration of knowledge of the human body and its multiple functions. Instructional approaches are suited to the broader knowledge base and learning skills of third semester nursing students. The topics introduced in Anatomy and Physiology III can include: nutrition, genetics, the endocrine system, and the reproductive system. The main focus of this course is on the care of adults and elderly clients experiencing loss of autonomy who require institutional nursing care. The emphasis is on the concepts of autonomy, self-care and loss, including developmental issues related to the aging process, and care of the client in the final stages of life. Ongoing themes include client-family teaching and ethical and legal aspects of professional practice. In the practicum, the student puts into practice the theoretical knowledge and skills learned in the classroom and laboratory. Focus is given to the role of the nurse in the interdisciplinary team. This course is built on the knowledge and skills acquired in the Fundamentals of Nursing II and Pharmacotherapy courses, as well as the courses in Lifespan Development and Sociology of Families, Diverse Cultures and Communities. It is focused on the care of elderly clients in acute-complex care and geriatric-long term care settings, and on adults with mental health problems in acute care centres. Students will be exposed to different theories, concepts and research findings that will help them better understand human development. Students will be able to learn about cognitive, physical, psychosocial changes taking place in different stages of life starting from birth until death. This will increase their knowledge of the needs, personality traits and behaviours of clients and their loved ones, therefore enabling them to work with different clienteles. Microbiology and Immunology is designed specifically for the Nursing program and is the fourth and last mandatory biology course for all nursing students. It introduces students to a broad range of fundamental concepts in microbiology and the understanding of the immune system. Emphasis is placed on the characterization of various types of invaders and the immune response generated by their presence in the human body. Instructional strategies are suited to the learning skills of fourth semester nursing students acquiring knowledge in a new discipline of biological sciences. In this second medicine surgery course, the student continues to learn common health problems, diagnostic testing, medical and nursing interventions. Students learn how to intervene with hospitalized adults and elderly clients requiring medical and surgical nursing. Focus is given to nursing care for surgical clients. In the laboratory sessions, the student learns advanced nursing care procedures required for medical-surgical client care. The practicum component takes place in acute medical and surgical care settings. The student plans care and performs interventions based on the knowledge and skills acquired and develops critical thinking skills. The focus of this course is to intervene with clients requiring nursing care in a perinatal setting. Content focus is on women’s health, pregnancy, labour and birth, postpartum period, the newborn, childbearing at risk and the newborn at risk. In the practicum, the student puts into practice the knowledge and skills acquired in theory and laboratory. Focus is on promoting a healthy lifestyle and health teaching. The family has often been referred to as the foundational social institution of a society. As such, it plays a crucial role in shaping individual beliefs, attitudes and behaviours, such as those related to health and health services. The family can also be considered as the mirror of social inequalities and social change, as well as the stronghold of ethnic, cultural and community values. This course provides future nurses with background knowledge which will allow them to situate the various family structures within the larger context of society, as well as the interaction between culture and community. This course also explores a variety of issues affecting healthcare delivery for marginalized communities and social groups. Ultimately, all these dimensions have an impact on the nurse/patient relationship and on nursing practice in general. Future nurses will then gain a more global view of health and nursing, improving their abilities to interact with patients from diverse social and cultural origins. In this third course with a focus on medicine and surgery, the focus is on care of adult and elderly clients requiring complex medical/surgical nursing care. Content focus is on complex health problems, diagnostic testing, medical and nursing interventions. In the laboratory sessions, the student learns advanced nursing care procedures required for medical-surgical client care. The practicum component takes place in acute medical and surgical care settings and allows the student to analyze in depth, the nursing role in the healthcare system, how to adapt to various work situations and learns to establish a cooperative relationship with the members of the interdisciplinary team. The student plans care and performs interventions based on the knowledge and skills acquired and develops critical thinking skills. Emphasis is put on acquiring competencies to ensure continuity of care. The focus of this course is on care of clients requiring mental health nursing care. The student is introduced to foundations of mental health nursing, commonly encountered mental illness, therapies and community resources. In the practicum, the student must consider ethical and legal implications, personal and professional values, crisis management and apply therapeutic communication skills. Collaborative participation with the professional care team offers the student a new perspective on the nurse’s role in the interdisciplinary approach to care. The focus of this course is on the synthesis of knowledge and skills acquired throughout the curriculum of the Nursing Program and the enactment of the professional nurse role in an integration practicum. The student will continue to explore and define his/her role as part of the professional healthcare team and learn to adapt to current workplace situations. The content allows the student to further explore the ethical principles and values that guide the nursing profession. During practicum, the student demonstrates the integration of concepts, knowledge and skills relevant to the care of clients in a variety of acute and ambulatory care settings. 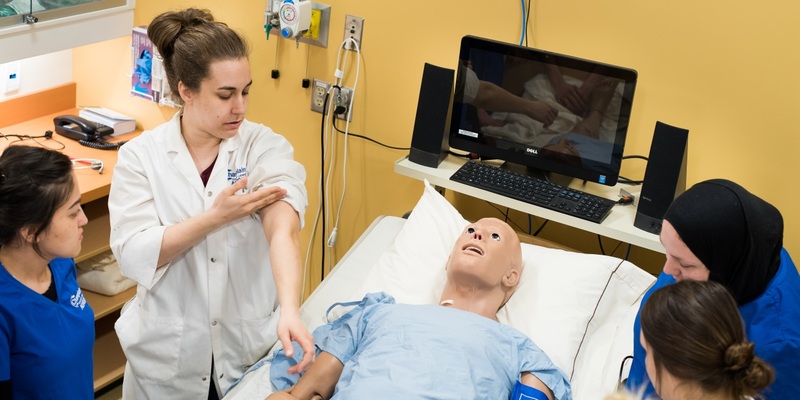 The students demonstrates his/her ability to work autonomously, demonstrating an ability to transition from the role of student nurse to graduate of the Nursing Program.